This book is a step-by-step guide to help individuals take their career to the next level. This book helps you focus on the tools and internal strengths you already possess. Consider this book an introduction to your new beginning. 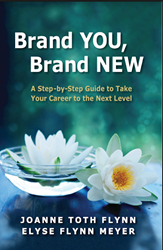 Joanne Toth Flynn and Elyse Flynn Meyer, a mother-daughter team, are excited to announce their co-authored personal branding book, Brand YOU, Brand NEW, a Step-by-Step Guide to Take Your Career to the Next Level. Brand YOU, Brand NEW is a journey to personal and career transformation. Through their collaborative approach, Joanne Toth Flynn and Elyse Flynn Meyer provide a range of universal perspectives to help you optimize your personal Brand YOU. This book takes individuals through the critical steps needed to proactively manage their brand and personal development. The goal is to put the reader in the ultimate career control seat. “In the past, personal career management was often handled by your company. But the question you must ask is, can you still rely on that old paradigm when it comes to your career and your life? It’s time to take your career journey into your own hands,” says Joanne Toth Flynn. “In the book, Brand YOU, Brand NEW, we focus on the key criteria to help you maximize your potential. To succeed, simply focus on the tools and internal strengths you already possess. Consider this book an introduction to your new beginning,” says Elyse Flynn Meyer. Learn more and order your copy of the book.